It’s pretty commonplace for at least one parent to meet a tragic end in a Disney movie, but the death of Bambi’s mother is definitely one of the most heartbreaking, even more than 70 years later. It took Walt Disney and his animators a while to figure out how they wanted to show that pivotal scene; they considered letting viewers see the actual shot before deciding to go with a more subtle approach. That's just one fact you might not have known about the classic animal film—read on for 12 more. 1. LIKE MANY DISNEY MOVIES, BAMBI WAS BASED ON A BOOK. The novel, Bambi: A Life in the Woods was intended for adults, not children. If audiences thought the death of Bambi’s mother was a bit harsh, they obviously hadn’t reviewed the source material: Among other things, Bambi’s father shows him the corpse of a man who had been shot by his fellow hunter to show that humans weren’t immortal. 2. BAMBI AUTHOR FELIX SALTEN MADE ALMOST NOTHING FROM THE MOVIE. 3. THE BOOK WAS BANNED IN GERMANY. The Nazis believed Salten’s book could be viewed as an allegory for the plight of Jewish people in Europe. They banned it in 1936. 4. THE ANIMATORS STUDIED DEER EXTENSIVELY TO GET THE MOVEMENTS JUST RIGHT. Artists spoke to animal experts, spent time at the Los Angeles Zoo, and watched nature films. They even got up close and personal with two deer donated to the studio. But animators really showed their dedication to the craft when they observed a deer corpse in various stages of decomposition for several evenings to see how the muscles and tendons really worked. “Unfortunately, each time he contracted or extended any part of the cadaver a rich aroma was pumped into the air,” animators Frank Thomas and Ollie Johnston recalled. 5. THE ANIMATION WAS EXTREMELY TEDIOUS. Artists had to make sure that each spot on Bambi’s back was replicated perfectly in every frame. The attention to detail meant that animators were able to complete less work on a daily basis than they had on previous movies. 6. WALT'S OWN DAUGHTER PROTESTED THE DEATH OF BAMBI'S MOTHER. When Diane Disney complained about the needless death, her dad explained that he was just following the book. She proceeded to point out other instances where his movies had veered off from the original material, and besides, she said, he was Walt Disney and could take whatever liberties he liked. 7. "MAN IS IN THE FOREST" HAD DOUBLE MEANING. It’s uttered in the movie to warn of approaching humans, of course, but to Disney animators, it also meant something else: Walt was coming down the hallway, and anyone who was slacking needed to shape up immediately. 8. THE MOVIE IS RATHER ECONOMICAL WITH ITS DIALOGUE. Although the animals in the movie speak, they don’t speak much; there are fewer than 900 words in the whole film. 9. 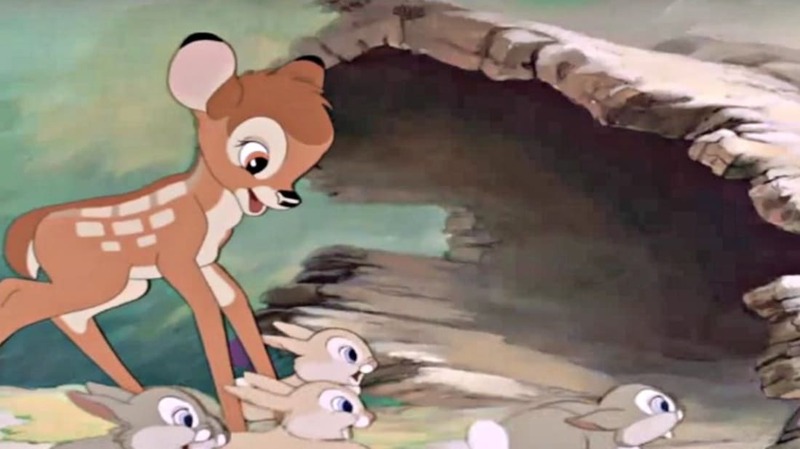 SOME OF BAMBI 'S ANIMATION SEQUENCES WERE REUSED IN OTHER MOVIES. Over the years, Disney has often employed an animation technique called “rotoscoping,” where animators trace over the frames of old footage to use it in a different environment. Check out this video for a few examples of how animation from Bambi and other early films ended up in later movies. 10. THE STUDIO CONSIDERED A BAMBI "ROAD SHOW." Instead of a standard release, the road show would have placed the movie in theaters specially outfitted with advanced sound systems and limited the number of daily showings. 11. BAMBI LATER BECAME A CAREER MARINE. In 1940, six-year-old Donnie Dunagan was picked for the role of a lifetime: Disney hired him to provide the voice for the lead role in his newest animated feature, Bambi. Dunagan retired from acting after that, and became a decorated career Marine—and its youngest-ever drill instructor, in fact. He served in the Vietnam War and was wounded three times. Dunagan didn’t want to give recruits or commanding officers any extra reason to harass him, so he kept his mouth shut about his child acting past for the duration of his entire career. He says it didn’t come up until he was two months away from retirement, and, swamped with other things, balked at completing a task an officer had asked him to do. "He looked at me, pulled his glasses down like some kind of college professor. There's a big, red, top-secret folder that he got out of some safe somewhere that had my name on it. He pats this folder, looks me in the eye and says, 'You will audit the auditors. Won't you, Maj. Bambi?'" 12. THESE DAYS, DUNAGAN EMBRACES THE PAST. "I love it now,” he has said. “When people realize, 'This old jerk, he's still alive and was Bambi.' And I wouldn't take anything for it, not a darn thing for it."